Described by others as quaint and exotic, or as depraved and threatening, and, more recently, as successful and exemplary, the Chinese in America have rarely been asked to describe themselves in their own words. 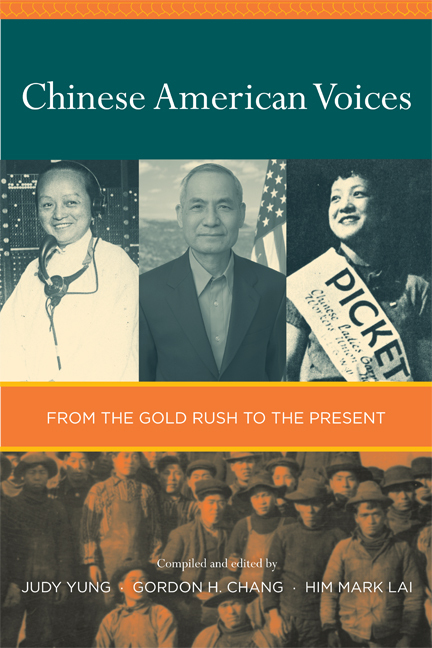 This superb anthology, a diverse and illuminating collection of primary documents and stories by Chinese Americans, provides an intimate and textured history of the Chinese in America from their arrival during the California Gold Rush to the present. Among the documents are letters, speeches, testimonies, oral histories, personal memoirs, poems, essays, and folksongs; many have never been published before or have been translated into English for the first time. They bring to life the diverse voices of immigrants and American-born; laborers, merchants, and professionals; ministers and students; housewives and prostitutes; and community leaders and activists. Together, they provide insight into immigration, work, family and social life, and the longstanding fight for equality and inclusion. Featuring photographs and extensive introductions to the documents written by three leading Chinese American scholars, this compelling volume offers a panoramic perspective on the Chinese American experience and opens new vistas on American social, cultural, and political history. Judy Yung, Professor Emerita of American Studies at the University of California, Santa Cruz, is author of the award-winning Unbound Feet: A Social History of Chinese Women in San Francisco (California, 1995) among other books. Gordon H. Chang, Professor of History at Stanford University, is editor of Asian Americans and Politics: Perspectives, Experiences, Prospects (2001)and author of other books. Him Mark Lai, Adjunct Professor of Asian American Studies at San Francisco State University, is author of Becoming Chinese American: A History of Communities and Institutions (2004), and other books. On the Normalization of Relations Between China and the U.S.